'Who Will Be Accountable' for the SDGs? These have been critically important months for advocacy and campaigning around the new global development agenda, whose broad parameters are set to be agreed at the UN General Assembly in September. 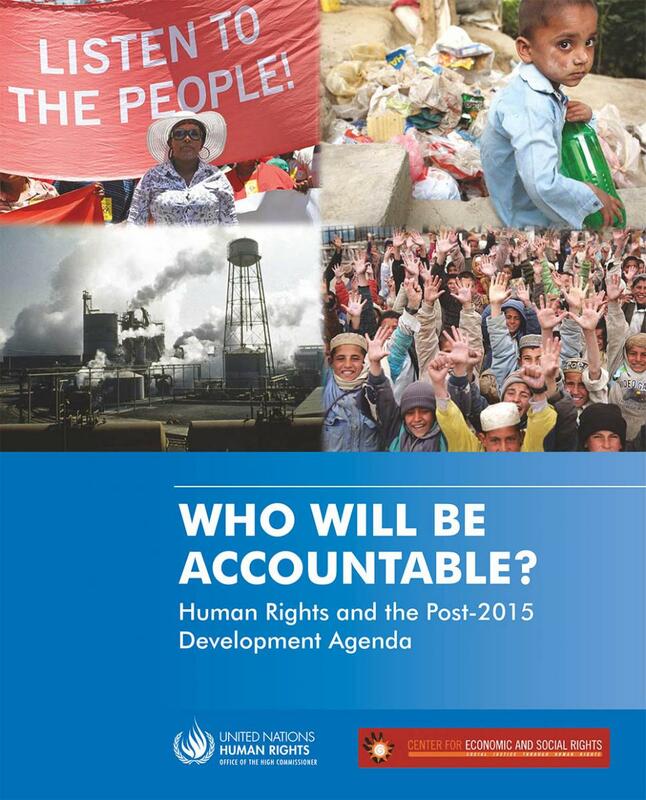 Against this backdrop, a timely new publication produced by CESR and the Office of the High Commissioner for Human Rights argues that proper accountability mechanisms must be incorporated into the post-2015 development plan if it is to avoid the pitfalls which have impeded progress towards the current MDGs. 'Who Will be Accountable? Human Rights and the Post-2015 Development Agenda' elucidates the role accountability must play if the new goals are to translate into real policy change on the ground and, thereby, meaningful improvements in the lives of ordinary people. It examines the accountability gaps that have hindered the MDG process so far, giving consideration to both national governments and other development actors within, above and beyond the state. The document was released just as the High-Level Panel on the Post-2015 Development Agenda (HLP) delivered its report, which is likely to influence the Secretary General's recommendations to the General Assembly on the design of the new framework. The HLP document made the welcome affirmation that the post-2015 goals and targets should be grounded in respect for universal human rights and should pay greater attention to inequality so as to "leave no-one behind". Nevertheless, the fragmented and inconsistent incorporation of human rights in the report's operative proposals, together with the outdated vision of market-led development they betray, is more likely to result in a "business as usual" scenario that falls far short of the "big transformative shift" the Panel claimed to be proposing. CESR issued a statement in response to the report, setting out the shortfalls in the HLP's proposals and offering suggestions on how the Secretary General and UN member states can integrate human rights and accountability more meaningfully into both the post-2015 framework and plans for its implementation. At the heart of CESR's continuing efforts is the understanding that the new development agenda must be based on justice rather than charity. If the successor framework is to deliver on its promises, it is crucial that those suffering deprivations be empowered to participate in the development process and challenge decisions that affect their lives. Effective systems of accountability, capable of addressing the asymmetries of power which perpetuate poverty and inequality, will be crucial to this endeavor. As the Secretary General prepares his report for the forthcoming General Assembly, it is to be hoped that both he and the international community will rise to the challenge of agreeing a framework that is sustainable, legitimate and transformative. In order to bring such an agenda to fruition, the plan will have to go beyond rhetorical references and incorporate human rights principles as the normative building blocks of a more just development paradigm. This means aligning the post-2015 commitments with existing international obligations across the spectrum of civil, political, economic, social and cultural rights; identifying clear rights holders and the corresponding responsibilities of all relevant duty bearers for each mandated action; and establishing measurable benchmarks and indicators in line with human rights standards that can be the basis of rigorous and regular monitoring. It also means putting in place an accountability infrastructure at the international, national and local levels so as to ensure that all relevant institutions are answerable for their commitments and subject to enforceability where delivery is failing. The demand for human rights to be at the core of a new development paradigm is increasingly being echoed within and beyond the human rights community worldwide. With the wellbeing of current and future generations hanging in the balance, it is crunch time for the future of global development. 'Who Will Be Accountable? Human Rights and the Post-2015 Development Agenda' can be accessed in pdf format here. A summary of the document is also available in English, Spanish, Chinese, French, Arabic, and Russian.